Tengah, which is found in the Northern part of the archipelago. In Sulawesi, the Peninsula and some regions of Sumatra, the sheath has a shoe called buntut. 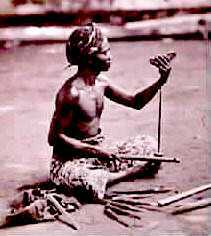 When making a Warangka, the Mranggi pays a special attention to the choice of the wood, it is made from the most ornamental wood, which is often not the strongest. Many Gandar (lower part of the sheath) are fitted with a metal sleeve: the Pendok. A painted warangka is called "sunggingan". Kemuning (Murraya Paniculata), honey hardwood with a beautiful flame-like, luminescent grain running through it.